We know there’s still a few weeks until the winter holidays, but it seems to us that it’s beginning to look a lot like Christmas! To get you inspired and well-prepared for your holiday photo session, we have come up with a series of Christmas photography tips, tricks, and ideas. spread the holiday cheer with some Christmasy photographic gift ideas. Christmas is all about enjoying time with your family and friends. That is why we encourage you to start capturing the festive mood from its early stages. Tree decorating, gift wrapping and holiday cookie baking give a sense of the celebration scene and you shouldn’t miss shooting any precious moments spent with your dear ones. Start documenting your holiday with a few shots of the preparations going on around the house. This should be the starting point of your Christmas story in images. Pro tip: prepare your camera too. Make sure you empty your memory cards and have the batteries fully charged. Take wide shots to present the scene, medium shots to get a closer sense of the action, and close-ups to emphasize meaningful details. In part II of our Christmas photography guide, we will focus on introducing the characters to the story too. Stay tuned :). We don’t want to get all technical, but in order to transcend technology and get creative about photography, you first need “to rule the rules” (rules of composition, settings, techniques). Find the perfect balance – the difference between an ordinary photo and an extraordinary one lies in achieving a balanced composition. The rule of thirds come into play here. When taking a shot try to split the image into three (imaginarily) and to place your subject along one of the lines. This trick will create a harmonious balance. Use natural frames to draw your viewer into the festive atmosphere. These can be anything from tree branches to beautifully decorated window or door frames. Layer your shots. Pay attention to both the foreground and the background elements in your shots. For instance, you can play with the mood and atmosphere in your photographs by achieving a diffuse background. All you need to do is set a wide aperture (between f/1.4 and f/2.8) and get closer to your subject in focus. Avoid cluttering. The ultimate tip we have for you here is to avoid cluttering your images. We all have a tendency to exaggerate during the holidays, be it with food, presents or decorations. Don’t stuff your images too much, though. Let your subjects breath. Combine wide, medium, and close-up shots to give a more dynamic sense to your photographic story. Recommended Photo Equipment: Use More than One Camera. Use your DSLR for portraits and more sophisticated shots such as close-ups and Christmas tree pics. You can use your smartphone camera for fun, spontaneous shots around the table. Also, don’t hesitate to take a more portable, compact camera with you for outdoor shooting. Be it a mirrorless or a point and shoot photo device, it will come in handy if you go ice skating with your friends and wish to immortalize the moment. Share the joy of photographing with the little ones in your family with a Polaroid-style, mini instant film camera. If you don’t have one, put it on your wishlist. Santa might see it. Next, consider exploring the outdoors more. The holidays give you the opportunity to hone your street and architectural photography skills. Everything is beautifully lit and decorated, but there are more challenges than you can imagine. Tree lights, candles, fireplaces, or bonfires – winter holiday lights can make for memorable photos. This diversity of light sources, though, may be overwhelming as capturing it perfectly in your shots is one of the hardest things to achieve in photography. One of the most popular shooting techniques when it comes to photographing Christmas lights is Bokeh. 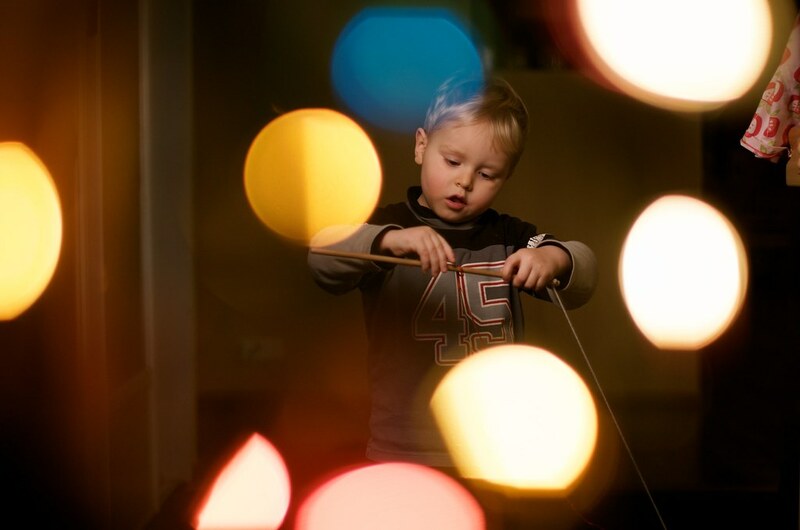 Bokeh is that blurry effect you achieve in the out-of-focus areas of your shots by using a wide aperture lens. Your Christmas lights will appear like little, colorful and diffused balls of light. Commonly, the Bokeh lights are placed in the background. For a more powerful effect, though, we encourage you to put them in the foreground even if they will cover your subject a bit. Christmas is also that time of the year when people magnificently decorate their houses. Go out there and capture your town’s holiday mood. What a wonderful time of the year to explore the streets and use your photo equipment to the fullest! You’ve got the perfect lights, but how do you find the perfect light for your shots? Setting the ISO and Aperture right: during the day you should profit from the natural light coming from your windows. We all know, though, that the Christmas magic begins at dawn. What you should do is turn off the flash and increase your ISO as much as you can without altering the image accuracy (ISO 800 would work well if you use a DSLR). At the same time, you should lower the aperture (somewhere to f/2.2) and shutter speed. Setting your camera on Night mode: most digital cameras have this function. The use of long shutter speed allows you to capture scene details in low light conditions by freezing the subject. The only inconvenience is that this mode automatically fires the flash to illuminate the foreground. You might get some interesting effects, but it may also affect the quality of your shots dramatically. Using the flash – when and how: when shooting Christmas lights or portraits near the Christmas tree it is best to turn off the flash. However, if you still need to use it, there is a way to improve the quality of that light. A diffuser or white paper taped over it will soften the light and enhance the look of your subjects. Add an artistic touch to your outdoor night photography with slow shutter speed techniques. The key to achieving an abstract look for a stunning Christmas street lights pic is slowing down the shutter speed to about 1/2 s. Use a tripod to hold your camera still and that’s it. For a more dramatic effect wait for a card to pass by. Recommended Photo Equipment: Macro Lenses, Wide Angle Lenses & Tripod. A good bokeh effect can be achieved by using a macro lens. This will make your subject stand out sharply against the diffused background. Also, when shooting in low light, a tripod is an absolute must. The benefits of using such a tool range from stabilizing your image to taking amazing panoramic and night shots. For broader scene views, we recommend using a wide angle lens as well. This section continues with a few more storytelling tips & ideas for your Christmas photography focusing on the celebration day. Since Christmas is a holiday you best enjoy with your loved ones, you should also tick off a few group portraits from your checklist. Besides the traditional poses around the Christmas tree or around the table, try to give a fresh look to your shots. Consider the location beforehand. Taking both indoor and outdoor group photos will require different settings and adjustments. A few more tips: get as close as possible so you can focus on the eyes of everyone in the picture. What you want is to express the relationship between them. One of the well-known tricks is to ask everyone to hug or lean their heads in close. Take multiple shots so to make sure that if someone blinked you’ve got them covered. Shoot from above to avoid capturing double chins (asking people to raise their chin might transform into unnatural posing). If you don’t use a wide angle lens, you can play with the aperture settings. Set the aperture around f/8 (medium) for a greater depth of field. Always make sure your ISO values are set accordingly. It is desirable to shoot in natural light, but what about taking group photos during the Christmas party? Let’s see how you can avoid washing out skin tones and Christmas lights when shooting indoors. If you have a DSLR, we recommend you to bounce flash off the ceiling or a wall. This way the light will be diffused and the flash won’t fire in everyone’s eyes. Switch to Night mode if you don’t have a flash you can bounce. Switch from auto White Balance to a more suitable preset for indoor shooting like incandescent or tungsten. Recommended Photo Equipment: Wide Angle Lenses. If you got yourself a wide angle lens (55mm max), the wide focal length will allow for perfectly taken group portraits. This type of lens is ideal if you want to shoot big family portraits as you can zoom out and capture wider scenes at the same time. Recommended Read: Perfect Christmas Family Photo Ideas. Apart from all those traditional poses on everyone’s checklists, you can take one step further and try to be more spontaneous. There is no better occasion for taking candid photographs than Christmas. Keep your camera close and take photos when friends and family expect less. Wait for them to be distracted or focus upon something that drew their attention like an ornament, book, or cookie. Also, the key to candid photography is adding emotion to your images. Wait for everyone to get comfortable and absorbed in conversation. Then capture that natural, beautiful human interaction, and add a sense of story to it. Turn of the flash as there is nothing like it to ruin a spontaneous moment. Take multiple shots as you never know which one is he perfect one. Recommended Photo Equipment: Telephoto Lens. A telephoto lens is ideal to get really close to your subjects without ruining their intimacy. Don’t forget to focus on details and take a few close-ups which you can then transform into cute Christmas cards. Recommended Settings and Techniques: Switch to Macro Mode. Set your camera on Macro mode and focus on all the small things around the party that make a difference: tree ornaments, table and doorway decorations, holiday cookies and sweets. Recommended Photo Equipment: Macro Lens. If you have a macro lens, now it’s the perfect time to practice using it for sharper and more detailed images. Chapter 1: It’s Time for Presents! One of the key moments of a Christmas gathering is the opening of gifts. Now it is your opportunity to capture a wide array of emotions, moods, and facial expressions. Set your camera to continuous shooting mode and take as many shots as possible. You will end up with series of photos that tell the story of each gift. Plus, the facial expression on everyone’s faces, be it joy or disappointment, is priceless. Ask someone to photograph you as well when opening your presents. One of the mistakes photographers make is missing from the holiday photographs. Take a break and enjoy the festive moments! To make your Christmas story more dynamic, you can also shoot videos with key moments, from early preparation stages to unwrapping gifts and partying. You can also create time-lapse series for each moment mentioned above. This way you get to be part of the scene too. Pro tip: place your camera in one corner of the kitchen to capture some baking fun moments, as well as in one corner of the room during the day. If you use multiple cameras, that’s even better. Pay attention to framing. Visualize the scene before placing your camera on a solid surface where you can leave it for a few hours. Perform the necessary settings according to the light you have available and other conditions that may alter the image quality. You can use manual exposure or set your camera on priority mode. Have greater control over the results by shooting in RAW format. Focus according to the elements of interest you have in the foreground. Choose the right lapse. The interval between the shots is important for determining how long the time-lapse will take. For a 10 second-footage you will need 300 frames (it takes 30 frames to create one second of video). Let’s say you will choose an interval of 5 seconds. Multiply it by 300 and you know how much time the time-lapse creation will take. A tripod is a photographer’s best tool when shooting time-lapse or videos. Recommended Read: DSLR Guide for Beginners – more tips on how to use your camera to its full potential. Your Christmas photography work doesn’t end up when your guests return to their homes or when your little ones go to bed. Your friends and family will be waiting for you to send them the holiday pics. Besides sharing your best shots on Facebook and Instagram to get everyone excited, you can create an online gallery for them to see a selection of best pics and even download the ones they like the most. Here is a nice post-Christmas gift idea for your loved ones: print out your best family shots to create a photo album or have them framed. Also, you could make nice holiday cards and send them to your friends by post. Besides the actual gifts, there is also the almost forgotten experience of holding photographs in one’s hands and that adds up to your holiday priceless moments. We hope our Christmas photography guide will help you hone your skills and make your holiday photo session more enjoyable. Stay tuned! We’ll get back with some awesome New Year’s Eve photography tips and tricks.